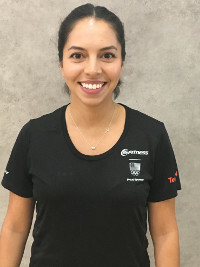 24 Hour Fitness Personal Trainer Bio Monica C.
Hi there, I am Monica. I grew up in an active environment and began swimming competitively at the age of 9. I continued competing all the way through high school and taught swim lessons for 8+ years. I found it quite easy to move around in my daily life and could pick up and go at any time. When I began college I put fitness and any sort of "healthy" living at the bottom of my priority list. I slowly began to lose my strength and energy as time passed but still considered myself an active person. It was not until I got shingles from the stress in school and work that I truly noticed how long it had been since I took care of myself mentally and physically. I noticed how trapped I was in my own body. For the first time, there were limits to what I could do physically and it took a toll on me mentally. I know what it feels like to think it is impossible to make progress or reach a goal but I pushed myself to continue and I am so grateful I did. I am passionate about helping others help themselves and consider myself a firm but fair person. I am here to help you learn about your! body and experience the freedom to move optimally.